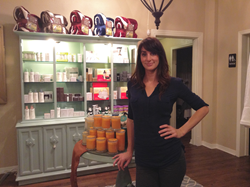 Gen Obolensky has been owner of Botanica Day Spa in Clearwater, FL for the last 10 years. Botanica Day Spa will celebrate their 20th anniversary this coming Monday, December 15th at the historic Capitol Theatre in downtown Clearwater, Florida. The spa will welcome clients, neighbors and friends who have helped the local business thrive for two decades. Doors open for this event at 6pm and admission is free. The first 300 guests to arrive will receive a complimentary gift bag of spa products and a $20 gift certificate redeemable at Botanica for products and services. Botanica will host this event in partnership with the Tampa Bay SPCA who will be present and accepting cash donations and animal supplies throughout the evening. Botanica will reward contributors for their donations with raffle tickets to win over $1200 in spa prizes. Gen says the decision to shift the spotlight to homeless animals in need came after witnessing her own dogs suffering at home. Her beloved cocker spaniels were almost simultaneously diagnosed with cancer earlier this year, spurring the decision to honor them with an event to raise awareness and resources for the Tampa Bay SPCA which provided care to over 9,500 live strays last year. Botanica Day Spa first opened the doors of its Cleveland Street location in 1994 before moving over to its current spot on Fort Harrison Avenue in 1997. Gen Obolensky, the spa’s owner for the last 10 years, began her career at Botanica as a licensed aesthetician working one-on-one with clients—many of whom still come to see her today. After 20 years in business, Botanica has become a Clearwater treasure known for their emphasis on the use of natural products and innovative treatments for the face, skin and nails. "Congratulations to Botanica Day Spa on their longevity and continued success in downtown Clearwater,” said Stu Sjouwerman, member of the Clearwater Downtown Development Board. “Their contribution to the growth of business is greatly appreciated." For more details or to RSVP online for Botanica’s anniversary celebration, please visit http://BotanicaTurns20.splashthat.com. You may also contact the spa at 727-441-1711 for more information. Space is limited for this event. The Botanica Day Spa 20th Anniversary Celebration will take place Monday, December 15th at the Capitol Theatre in Clearwater. Doors open at 6:00 pm, and admission is free with a cash contribution or donation of supplies to the SPCA.